Today I found you a (free!) beautiful 19 page tutorial on drawn thread work from the Heritage Shoppe. This shows you, in detail with many photos, how to do the work in this picture. It’s a type of embroidery where you cut some of the threads, pull them out, then decoratively embroider the remainder. Looks fancy, doesn’t it? It has three stages of increasing complexity, but keep in mind you don’t have to do all three at once. 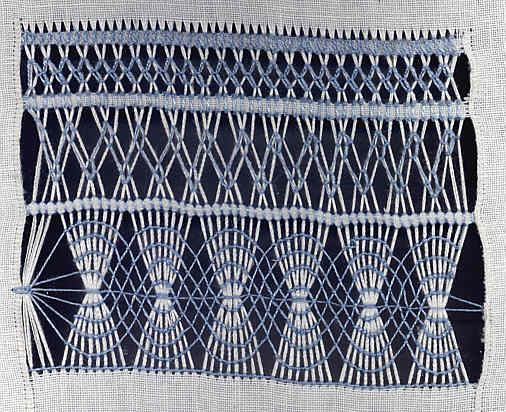 You can just do one of these, either as an accent to another style of embroidery or as a border. I suspect that if you have a background in tatting or crocheted doilies, the experience will make the work easier. 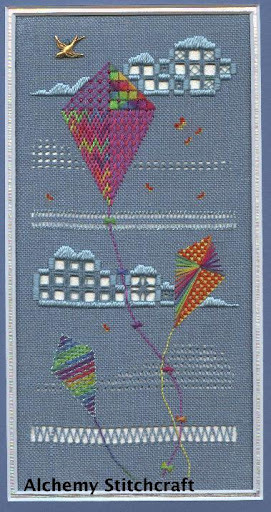 Now, perhaps you’d like some ideas for incorporating this into designs: UK designer Christine Wilkins of Alchemy Stitchcraft has some interesting kits with icicles and kites (and many other designs using cross-stitch, hardanger, pulled and drawn threadwork, and beads). I’ve linked the pictures to the kit description, so if you click it’ll take you there. The Heritage Shoppe also has a free 170 page introduction to embroidery, short essays on various embroidery topics (fabric and weaves, thread terms, descriptions of some embroidery styles, etc), and some discussions/tutorials of various stitches such as laid work, bullion stitch, shadow work, and Romanian couching, among others. Just so y’all are clear: these posts are not sponsored – I am not getting paid by the kit companies. These are just companies I saw and liked. 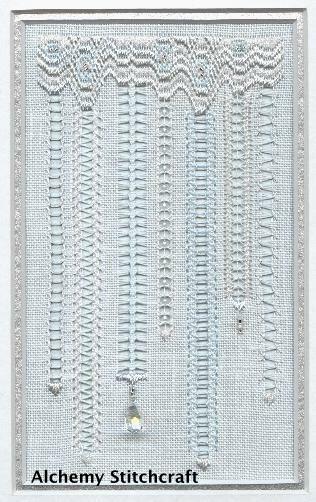 This entry was posted in Design sites, Drawn thread, Free resources online, Hardanger, tutorials and tagged alchemy stitchcraft, christine wilkins, drawn thread, embroidery, free resources, hardanger, heritage shoppe, pulled thread, stitches, tutorial. Bookmark the permalink. I agree with you about Heritage Shoppe – it is one of the sites I often read when want learn something. I’ve followed already those drawn thread directions you show today – all the three – and even not being English my mother-language I managed to do them more or less easily. They give written directions and the progress of the work in photos, which helped a lot. And I love drawn thread, of course 🙂 and wanted strongly to do that! Lovely blog you have her! Congratulations. I’m glad to hear from someone who has tried it. They looked clear to me, but it’s hard to tell for sure without working through it. I so enjoy your blog. Every day I log on to the computer you are one of the first places I visit. 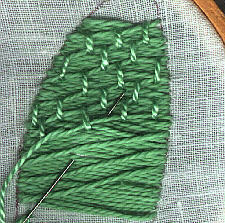 I would never have found all the lovely embroidery sites without your help, not to mention the patterns. For those of us who love embroidery your blog is a constant delight and I hope you keep it up for years! Oh, gosh, thank you! I sure do appreciate it. I guess I should mention that, while you are totally welcome to visit daily and I will read the comments daily, I’m only aiming to post three times a week (don’t want to burn myself out). At the moment I’m trying out Mon-Wed-Fri, but we’ll see if that sticks. Can’t wait to read the rest of your blog.